I (finally!) 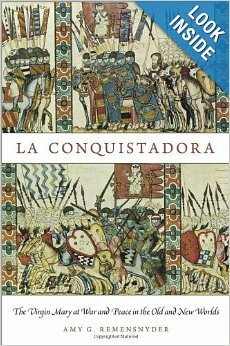 finished reading Amy G. Remensynder’s book La Conquistadora: The Virgin Mary at War and Peace in the Old and New Worlds, and have sent off a review of it to H-Net; I’ll post a link to it as soon as it’s published there. Here, I thought I’d add some remarks that didn’t make it into the review but which have a bearing on the book project, at least some of which amount to editing my earlier remarks here. Already, though, some of the claims Remensnyder has made about how Mary has been invoked and venerated during the Reconquista seem to mesh with observations made by Serge Gruzinski regarding miraculous apparitions of the Virgin in Tenochtitlan/Mexico City in his crucial book on Mexican iconology, Images at War: Mexico from Columbus to Blade Runner (1492-2019). Below the fold, I want to talk my way through some of that without making an argument, seeing that, as I noted, I haven’t yet reached Remensnyder’s discussion of Mexico. But I especially want to muse a little on her elegant phrase “Marian geography.” I’m betting she will use it when discussing this hemisphere, but (again, without yet knowing what she”ll say) I’d like to try to put a New World spin on that phrase that differs from the one it has so far had in her book. I am now officially in the book-reviewing business for H-Net, and the image you see here is the cover of the first book I have reviewed. Here is the link to the review itself, in case you’re interested. 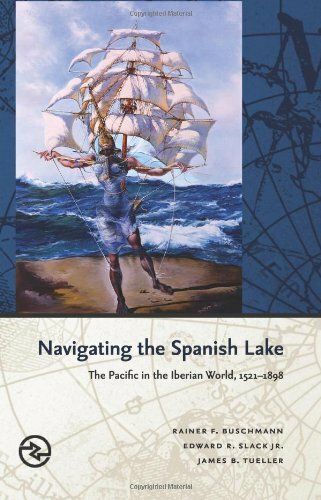 This isn’t the sort of book you’ll be foisting on other people as a test of whether you and they can be friends, but it does do what it says it will do: it seeks to alter historians’ prior assumptions about Spain’s control of the Pacific Ocean as having been pervasive and pretty much unchallenged at least until it lost control of its colonies in most of the Americas. Its prose is serviceable but, as I note in the review, its goal of appearing to have been written by one author (three authors are credited on the cover) gets undermined by some editorial choices, which caused me to become distracted by the question of just who was most responsible for what chapters. As these reviews get published, I will also be posting links to them under the “Reviews” tab on the blog’s home page.